Wielding the exhaust is a great no hassle option as it requires no maintenance. Often times, if you have your muffler replaced at the shop they will offer to do it for you for a small charge. Along with no maintenance, drivers can be assured that with wielding the exhaust they don’t have to worry about any components loosening over time thereby making this a great long term option. While some people view this as an unnecessary option, for drivers that don’t have the time to inspect their components regularly this is a great choice. Meanwhile, exhaust clamps get the job done well, but require a little more work. What’s important about these is making sure you choose the correct muffler clamp sizes and that you apply the clamps properly. This means not making them too tight as this can damage key components. There are many benefits to exhaust clamps. For one, they are easy to install and make it much easier to replace your muffler. Additionally, they are inexpensive as you can find affordable parts at your local auto parts store or online retailers. 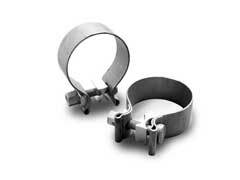 The only drawback to exhaust clamps is they may loosen over time, which may lead to a better chance of leaking. Therefore, it’s important to inspect them regularly to ensure they are in the correct position and are tightened. By doing regular inspections you can have peace in knowing your muffler is secured properly and you will reduce the risk of leaks. Ultimately, both are viable options for drivers. The choice comes down to your preference. If you feel comfortable checking regularly, you’ll find clamps to be more than sufficient for your needs. If you want a no hassle option, then have the unit weilded as this will prevent leaks from occurring. If you decide to buy clamps, you can find them at many retailers. Along with them you can also buy other key components such as exhaust pipes and exhaust hangers.